Born in 1969 in Sarajevo, Bosnia and Herzegovina, Endi Poskovic was educated in Yugoslavia, Norway and the United States. He studied music and art from an early age and during the 1980s performed traditional music of Western Balkans at festivals throughout Europe and the Middle East. Following his undergraduate studies, Poskovic studied Nynorsk language and culture for an entire year on a Norwegian Government sponsored Minnefindet Scholarship. From Norway, Poskovic moved to the United States to study at State University of New York at Buffalo, where he earned his M.F.A. Poskovic's creative practice considers a range of technologies as a way to explore certain characteristics of printed image: translation, multiplicity, seriality. Through his visual work, he seeks to construct representations that suggest broader themes of displacement, exile, memory and reconciliation. Merging visual image with text, Poskovic’s Majestic Series shifts the reading of the print by providing an unexpected new context, forcing the viewer to continually reinterpret. In La Souffrance et L’Aventure Series, Poskovic references such disparate influences as devotional pictures and hard-edged Eastern European propaganda posters. In Crossing Series and Dream Series, Poskovic explores primitive strategies of early cinema to investigate personal and social histories, shifting cultural identities, environmental transformation, migration and alienation. Poskovic’s works have been exhibited worldwide in numerous important international biennials and triennials including Shanghai Print International Biennial, China, Bienal Internacional de Grabado Caixanova, Spain, Taichung International Biennial, Taiwan, Print in the Post-Print Biennial at China Academy of Art, China, Krakow International Triennial, Poland, la Biennale Internationale d'Estampe Contemporaine de Trois-Rivières, Canada, Belgrade Printmaking Triennial, Serbia, Egyptian International Triennial, Egypt, Deutsche Internationale Triennale-Frechen, Germany, Tallinn International Triennial, Estonia, Xylon International Triennale, France, Varna Biennale, Bulgaria, Warsaw Impact Biennale, Poland, Ljubljana International Biennale, Slovenia, and New Prints Series at the International Print Center New York. Comprehensive solo exhibitions of Poskovic’s work have been organized by Philadelphia Print Center (2001), Plains Art Museum (2001), Des Moines Art Center (2006), Bemis Center for Contemporary Art (2007), Interlochen Arts Academy Dow Center for the Arts (2008), Frans Masereel Centrum in Belgium, which traveled to Stad Leuven Academie en Conservatorium and Academie voor Beeldende Kunst, Ghent (2009), Gallery 72, Omaha (2013), SUNY-Fredonia Rockefeller Arts Center (2014), Tidaholm Konstlitografiska Museet, Sweden (2015), and Changsha Yu Xiang Cultural & Art Center in Hunan Province, China (2017). 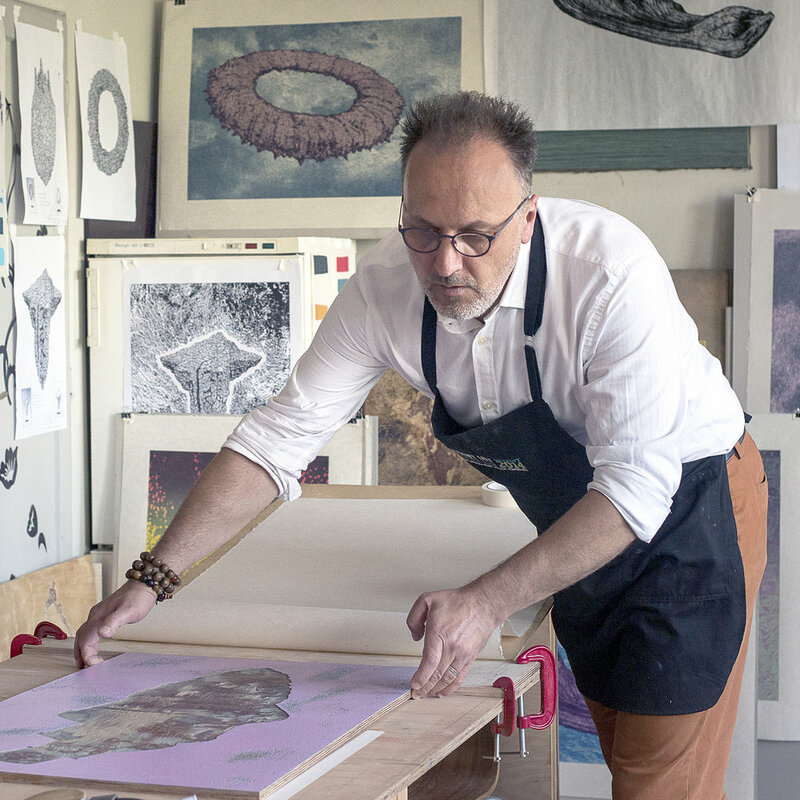 Poskovic is the recipient of notable grants and fellowships from the John Simon Guggenheim Memorial Foundation, John D. Rockefeller Foundation, Bellagio Center Italy, J. William Fulbright Commission Senior Research Fellowship to Poland, Pollock-Krasner Foundation, Camargo Foundation France, Open Studio Toronto-Ontario Arts Council, Indiana Arts Commission, Art Matters Foundation, New York State Arts Council, Durfee Foundation, Flemish Ministry of Culture-Frans Masereel Centrum, Bemis Center for Contemporary Art, McColl Center for Visual Arts, Can Serrat International Art Centre in Spain, MacDowell Colony, Virginia Center for the Creative Arts, Kala Art Institute, Valparaiso Foundation in Spain, Norwegian Government as well as research and teaching funding from the University of Michigan including the Office of Vice-President for Research Creative Arts Fund, International Institute Experiential Learning Fund for Teaching Abroad, Confucius Institute, Center for Japanese Studies, Center for Chinese Studies, Copernicus Endowment, and Weiser Center for Emerging Democracies. Poskovic’s works are represented in the permanent public collections of the Philadelphia Museum of Art, Detroit Institute of Arts, Fogg Art Museum-Harvard University, National Taiwan Museum of Fine Arts, New Orleans Museum of Art, Royal Antwerp Museum of Fine Arts, Centre National des Arts Plastiques Cairo, Orange California County Museum of Art, Kennedy Museum of Art, University of Iowa Museum of Art, Des Moines Art Center, Tampa Museum of Fine Arts, Vaasa Ostrobothnian Museum, Finland, Musée d'Art Contemporain Fernet Branca-Saint-Louis, France, University of British Columbia, Jincheon Museum, South Korea and many others. Poskovic is Professor of Art and Design at the University of Michigan Stamps School of Art and Design. Poskovic has lectured extensively and participated in numerous international conferences at universities and museums throughout Asia, Europe, Middle East, and North America. Prior to joining the University of Michigan faculty in 2008, Poskovic taught at Columbia College Chicago, Ball State University, California State University-Long Beach, the University of North Carolina-Chapel Hill, Daemen College and Whittier College. In 2012 and 2015, Poskovic was invited to serve as the member of the International Jury of the Krakow International Triennial, the largest and the longest running international competition in the field of print media.